PDF means Portable Document Format and it is saved with the .pdf extension. The listed Portable Document Format (PDF) submission website provides high-quality backlinks and traffic to your website. Portable Document Format (PDF) can be easily open, navigated, printed or forwarded on any OS and device (mobile/computer). This files can contain images, text, as well as interactive buttons, hyperlinks, embedded fonts, video etc. PDF submission sites grow users interaction towards the website, the idea behind this submission should be to provide as much information as possible combined with rich media rather than thinking only about getting a backlink from those platforms. 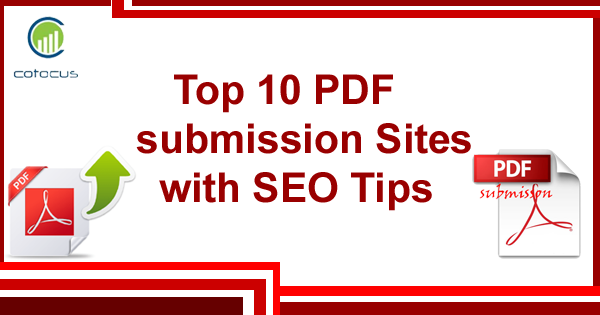 PDF submission is the best source for traffic and high rank. These are all the best PDF submission sites given above. How to Write SEO Friendly Content for a Website?